All the labels in this category are genuine real labels (not reproductions). 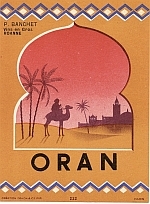 Algerian wine label "ORAN" from early to middle 20th century. Brand new condition (UNC). View of Château castle winery in Algeria; camel or dromedary carrying an Algerian person; palm trees; desert landscape. Reverse blank. Printed on a medium thin paper. 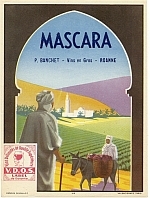 Algerian wine label "MONSONEGO" from early to middle 20th century. Brand new condition (UNC). View of winery buildings in Algeria among palm trees; trucks with wine cisterns; palm trees; desert landscape; sand hills. Reverse blank. Printed on a thin paper.